Advanced Embroidery Designs - Albrecht Durer. The Praying Hands. Design is divided in 2 parts by colors and does not require re-hooping! 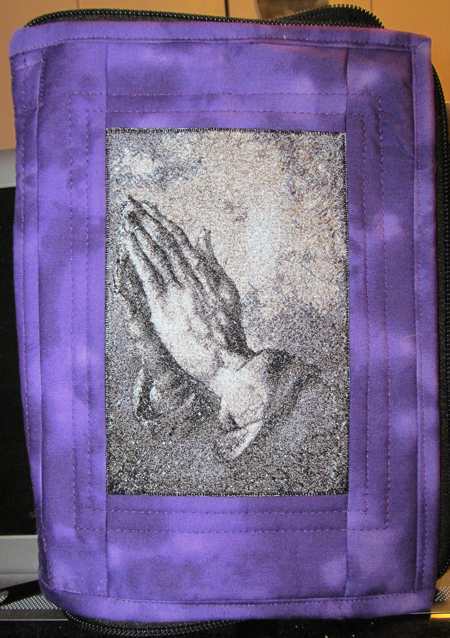 This machine embroidery design is part of our Religious collection. It uses the Photo Stitch technique. It will fit the Large hoop (5" x 7"). This is another version of the embroidery, done in sepia tones. I just changed all grey hues to brownish ones. This photo was sent in by Heather Denholm from Wanneroo, Australia as her Best Project 2014 entry. You can read more on the entry page.